Saddle Seat riding is an English style of riding (as are Hunt Seat and Dressage), but it is a uniquely American style of riding used primarily on Morgan horses, American Saddlebred horses, and Arabians. The goal in Saddle Seat riding is a truly thrilling performance. A saddle seat horse should be thrilling to watch; extremely elegant, classy, and stylish. Many casual spectators watching a truly good Saddle Seat performance may think the horse is about to burst with excitement, but the well-trained Saddle Seat horse is actually very responsive and comfortable to ride, like a finely tuned sports car. Saddle Seat riding is about animation. It is about a high head carriage with an arched neck, and lots of “action” or high-stepping. The canter should be very collected and slow, with the appearance of a rocking horse. Prize Contender, ridden by Don Harris. Note the extreme head carriage and leg motion. 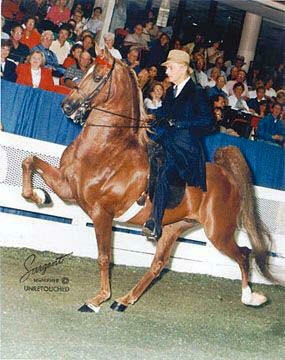 Many American Saddlebred horses are trained to do five gaits- the walk, trot, and canter, plus the slow gait and the rack (which is an extremely smooth four-beat gait performed “at speed”). Saddle Seat riding is done “on the flat” meaning that no jumping is involved. Horses are most often shown at the three gaits (walk, trot and canter), but classes are also available for five-gaited horses. Horses are shown in many different divisions, from the relaxed and mannerly Pleasure classes to the thrilling performances in the Park classes. Saddle Seat exhibitors range from young children to adult exhibitors. Suitable horses are available for novice riders as well as experienced ones seeking a challenge.